There is a whole world of young readers out there, who are ready to test their reading skills. Finding a children’s book that is ‘just right’ is important, so that they are not discouraged. The “I Can Read” series of books are made for this group of children. Of course, these books can be read out loud as well, and there’s lots of fun in that. At the same time, when a child can pick up a children’s book and read it independently, it’s as big as learning to ride a bike. I especially like the books by Minarik for several reasons. The illustrations in the books by Maurice Sendak are priceless. His gift for illustrating a children’s book with just the right sentiment is unparalleled. In addition, I really appreciate the large print, and the way the sentences are laid out so that there are not too many words on a line. This may seem like a small detail, but to a young reader, it is crucial to be able to reach the end of the line sooner rather than later! Finally, most of the sentences are one line, or two lines at the most. 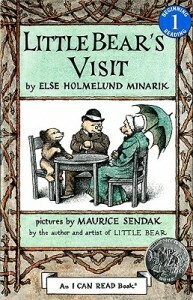 I chose this particular Little Bear book because it’s about Little Bear and his grandparents, making it most fun to read to your grandchild, or to read prior to a visit by a grandparent. Because the restrictions on accessible vocabulary, this children’s book, and others in the series, are not quite ‘great literature.’ But the stories are engaging, told with a simple, sweet heart, and perfect for learning to read. They are an essential part of a new reader’s library.